In my previous article, I wrote about how to use Google’s Font API for writing in unusual fonts on your website. The best thing about Google’s API is that it is FREE. The repertoire of fonts Google Font Directory has is also impressive. This directory already has about 450 fonts to select from. Google is continuously adding more fonts to this service. All the fonts available through Google’s directory are open source and free fonts. However, if you want to use a specific commercial font –you will have to pay for it. Fonts.com website has launched a service, similar to Google Fonts, in September 2010. Directory of Fonts.com has over 20,000 fonts and under their free plan there are more than 3000 fonts are available for free. The catch is that if you take their free plan –your website will have to show a “Fonts.com” badge. This option is OK for personal websites but professional bloggers and webmasters may not like it because it disturbs the aesthetics of the website. It is easy to use non-conventional fonts on websites. Another good thing about Fonts.com is that they have fonts available for almost all major languages. So, as long as you use UTF-8 encoding, you can display material in any language using these fonts. 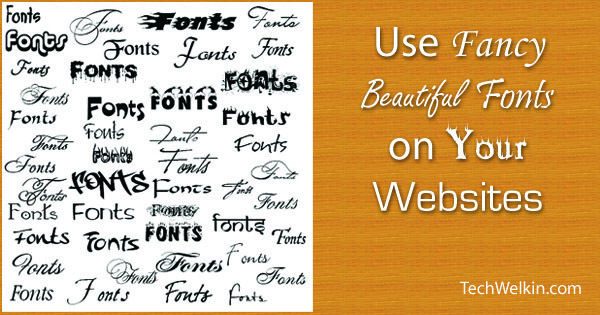 For personal websites, where aesthetics is not mission critical, this free service from Fonts.com is great. You get to use fancy fonts for free. But if you want to use any of those thousands professional stylish fonts, you can shell out a few bucks. Please let me know if you have any questions about this topic. I will be happy to try and help you. Thank you for using TechWelkin. Last updated: 23 September 2017 | Published on: 20 February 2012 | Authored and Edited by: Lalit Kumar and Team | Filed as: Home » Tips and Tricks » Fancy Fonts, Stylish Text, Nice Looking Website!